I enjoy these because they show how you're concentrating on different parts of the process. That's very cool. these are so free and yet, so skillful. like seeing a woman who is a natural beauty- that's what your paintings remind me of- fresh, natural and lovely. 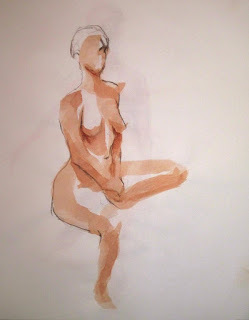 You're right that you're becoming a better diver every time you visit the reef of figure drawing. The shapes, forms and light you choose to note or emphasize are showing a great deal of confidence. I know what you mean about working too fast to actually be spending a lot of time looking - the act of applying the washes and defining the lines becomes an intensely visceral experience.. more like dancing than than what most people understand as drawing. We don't examine every person who passes our line of sight most days but understand their shape and the amount of space they occupy, we see that they are living, moving beings we share an area with and we adjust our movements accordingly. 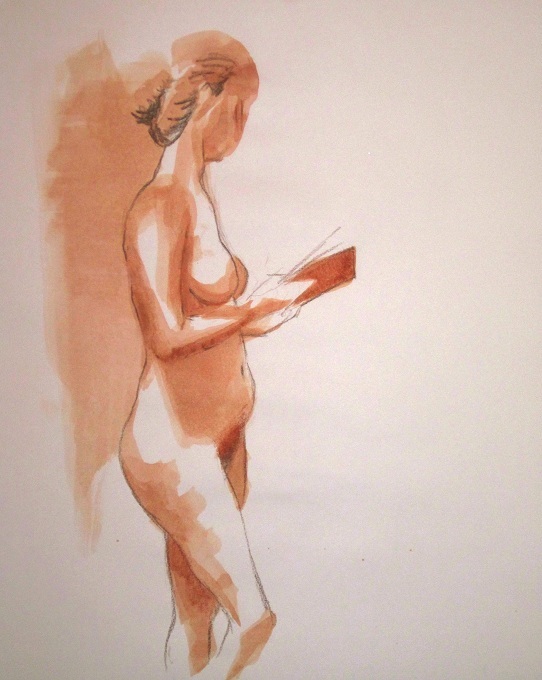 I like the hint of a face in the first, the highlight over the breast defined by the deep shadow. Her ribcage and stomach have just the right softness. 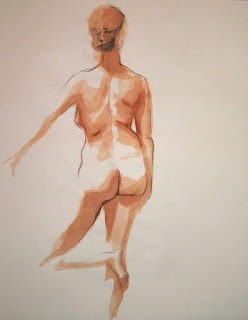 The balanced pose of the second drawing is what struck me first and then the honesty of the her fleshiness - deep shadows at her nape are followed by the ones than define the shoulder blade and waist. The light over the plane of her lower back that continues to the upper thigh which is just suggested by the curving line is very nice. I think this third one is my favorite. It's an incredibly natural pose and you've handled the softness of her form beautifully by your understanding of what her skeleton is doing to make it possible. The shadows are delicate and lovely. The last one is also nice and I like the way you've suggested a light source from the upper left. The light shadow of the area at her back helps define the curving lines. I quite enjoy seeing such wonderful proof of your progress. These are wonderful, Steve. Looking forward to more when you get to it.